The House stood and applauded the shooting death of Miriam Carey, further perpetuating the idea that black women’s lives are not worth as much as others. The US House of Representatives applauded the death of Miriam Carey before they knew who she was. They didn’t know about her postpartum depression, or that she talked about “wack men” on Facebook, or that she had been fired from a job last year, or that she lived in Connecticut or that she had been called a great mother. They simply applauded the unpaid work of the DC police in shooting and killing her. Carey caused a panic last Thursday when she allegedly attempted to ram her vehicle through the White House barricades. Early reports were that a shooter was on the loose, giving everyone paying attention flashbacks to just a few weeks ago and the Navy Yard shooting. But early reports are almost always unreliable, and we eventually learned that Carey was not a shooter, did not have a gun, had her 1-year-old child in the car with her and was shot as she stepped out of the vehicle. This is what our Congress stood up for and clapped. In the aftermath, with more facts at their disposal, has there been any great sense of remorse? Does the House regret that standing ovation? Put another way: has finding out that the police shot an unarmed black mother changed anyone’s perception of this fatal incident? It should, but by and large, it won’t. This is America. Violence against black women is routine and unchecked. And still, being convicted once again may be the best luck Alexander can hope for. At the very least, she can expect to escape with her life. Far too often, the violence against black women turns deadly. Islan Nettles knows. In August of this year, Nettles, a Harlem resident and transgender woman, was attacked and beat to death while standing on the corner of W. 148th St. and Frederick Douglas Boulevard. She was with a group of friends when several men walked by, among them 20-year-old Paris Wilson, who allegedly started cursing and taunting them with homophobic slurs. Nettles and Wilson exchanged words before Wilson allegedly punched her in the face, knocking her to the ground, and then continued beating her to the point of unconsciousness. She arrived to the hospital brain dead, her mother describing the horrific scene by saying “half of [her] baby’s [was] brain missing.” Wilson was arrested for misdemeanor assault. When the House stood and applauded the death of Miriam Carey, did they consider of any of this? Keep in mind this is the same Congress willing to commit its own violence against black women with the current government shutdown. As Brittney Cooper put it at Salon: “One of the programs most immediately affected by the shutdown is the Women, Infants, and Children (WIC) program, which provides vouchers for food and infant formula. The program can be sustained at the state level through the month of October, but will jeopardize the lives of 8.9 million people if the federal government doesn’t get its act together. The program disproportionately serves working-class women of color.” And according to The New York Times, in the effort to expand healthcare coverage under Obamacare, two-thirds of poor black and single mothers will be left out because they live in states under Republican control—Republicans who have decided it’s best for their states to not participate in the expansion of Medicaid. To take food out of people’s mouths and deny them healthcare is an insidious form of violence, but because it’s happening to black women, there is no national outrage. We would rather hem and haw about war memorials not being open to veterans. The violence takes many forms, but this is consistent: black women suffer and little is done about it. It is exacted with no regard for black women’s humanity. It is simply the way things are. 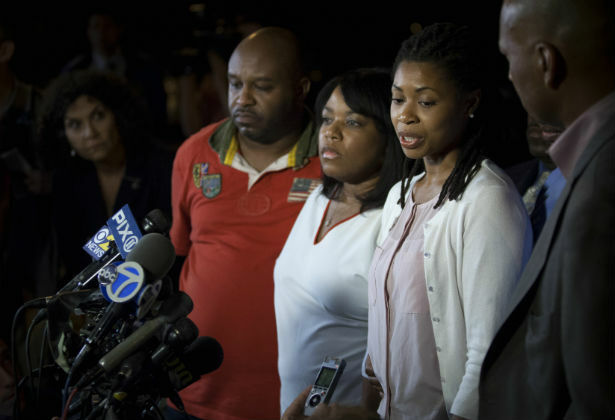 Rick Perlstein previously blogged about the culture of fear that contributed to the killing of Miriam Carey.